The ShadeNet feels like a plastic material. How long will it last and what is it made of? The ShadeNet is guaranteed for at least 8 years against UV degradation and is manufactured from knitted HDPE (High Density Polyethylene) and is treated for UV radiation. Will the sun not fade the colors and how long will the colors keep their brightness? All colors are pigmented with a light fastness of 7 to 8, which has the highest resistance to fading. The ShadeNet is guaranteed against fading. What about wind? Can they be damaged by high winds? All structures are designed to comply with local conditions and building codes. What about rust and can these structures be installed in coastal areas? Coastal installations have no effect on the ShadeNet. All metal components are hot dipped galvanized to minimize corrosion. If the ShadeNet is accidentally damaged or torn, would it require replacement of the entire ShadeNet? The ShadeNet is "lock-stitched" during the manufacturing process and will not unravel if accidently torn. In most cases,the ShadeNet can be repaired without having to replace or to remove the complete ShadeNet. What about hail, will this damage the ShadeNet? 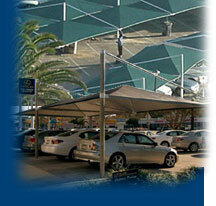 The original application of ShadeNet was to provide cover and protection against hail damage. Our structures are totally suitable for use against hail damage. Furthermore, installation of the structures against hail and sun damage can result in a significant reduction of insurance premiums. ShadeNet comes in Shade Only and Waterproof versions. The application and structure style and size will determine if waterproof is available. Can theses structures be used in snow? The standard ShadeNet profile is not suitable for use in areas with a heavy snowfall. The reason for this is simply that the slope of the ShadeNet is not steep enough to avoid a snow build-up. The solution to this problem is to either, remove the ShadeNet & store it during winter months or design a steeper pitched ShadeNet.